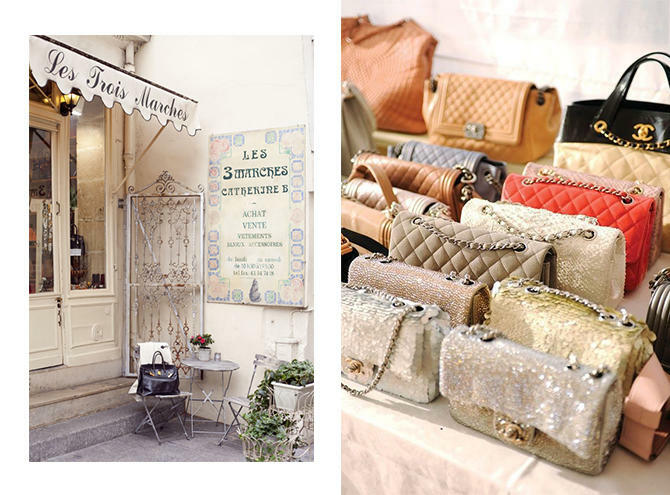 Where to buy a Chanel or Hermès Vintage bag in Paris – Blog Mode Tendance et Lifestyle| Paris Beaauuu! Today I come back with an article that will interest you a lot. Remember, at the beginning of the week I presented you my new Chanel bag that I offered myself for my birthday. Since I have been asked many questions about “my Parisian addresses” to buy a beautiful vintage Chanel bag (or Hermes), I thought this new post would be very interesting. And just before getting to the heart of the matter with my favorite addresses from where to find a Vintage Chanel Bag, I wanted to give you my 3 basic tips, really useful for a first purchase. Buy a leather bag, rather than one in fabric or glitter bag or even suede that will stain and spoil more quickly. A small boudoir shop delicately decorated in the heart of the Marais. The vintage bag selection is fairly small but still fair. The bags are in good condition and the saleswoman is charming. Horaires: from Tuesday to Saturday, 11:00am – 19:00pm. This shop is a real cave of Ali Baba! Here, there are Chanel and Hermes bags everywhere you put your eyes. The shop is small but contains treasures. In addition, the gentleman who runs the shop is charming. Horaires: from Monday to Saturday, 11:00am – 19:00pm. A small shop lost in a street between the Champs-Elysée, Avenue Montaigne and Avenue Georges V. Only few pieces but that does not prevent that we can fall on the bag of our dreams. Horaires: from Monday to Saturday, 10:30am – 18:30pm. Horaires: from Monday to Saturday, 11:00am – 19:30pm.